Recently, Traco hosted a dealer seminar to introduce not only their NX window series, but also to educate dealers about the future of windows. Janice Weber, our President and myself attended that great conference. 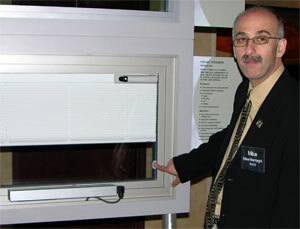 Today’s article will focus on Traco’s presentation of the future of windows. Mike Manteghi, Traco’s Director of Research and Development seemed to be the man in charge of futurism, and I believe he earned his role. Mike writes, and regularly receives on behalf of Traco, research grants from the US Department of Energy for his pioneering work stretching the boundaries of aluminum windows. With the push of a button, or a signal from an electronic controller, this glass darkens and lightens all by itself. If you have been reading some of our previous articles, you will immediately grasp the value of this: you can control solar heat gain based on need! In winter, you might allow much the sun’s energy to enter the windows and warm your living space with a SHGC of .48. In the summer, you can darken the glass, as if you are putting sunglasses on the building, and obtain a SHGC of .07! Visible light follows along, with a range of 65% TO 5%, thus glare is controlled along with heat. Ramifications of this concept go even further. By limiting peaks and valleys of SHGC, peak energy demand is reduced by 10-25%, and energy bills are reduced in the same range. When designing a new building with this feature incorporated, cooling and heating systems can be downsized by 3-25%. 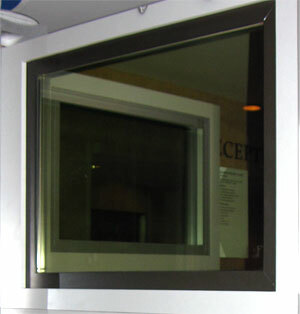 Vacuum glass can achieve R10, over three times better than typical insulating glass. 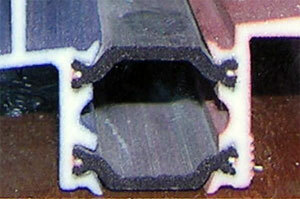 Veteran readers know that vanilla insulated glass performs at a paltry R 3, compared with a typical insulated wall of R 11. Vacuum glazing changes all of that. A typical insulated glass unit has a 1/2″ thickness of dry air between the two lites of glass. Vacuum glazing has a very small space between the glasss (less than 1mm), which is evacuated. It’s more entertaining, however, to say the space is filled with a vacuum. The lites are held apart by tiny unobtrusive pillars approx. every 3″ in each direction. At least one Low-E coating will be in the configuration. Aside from the great insulating values, this product saves on weight. Previously, to achieve a high R value, triple glazing or added insulation is needed. This concept obviates triple glazing and is perfectly clear. Currently a number of manufacturers are working hard to develop this promising technology for the market. So far limitations are glass size (max 1 meter x 1 meter), longevity and cost. Apparently it’s not so easy to stuff a lot of vacuum into that airspace! 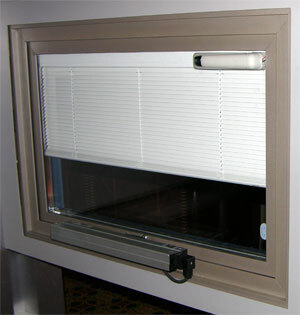 Click for more information about vacuum glazing. This is the type of window George Jetson would have had. It does everything except cook breakfast. Sensors feed the smart window’s computer with continuous data about interior and exterior temperature, humidity, light, CO2 and motion. The computer then tells the smart window to open or close, or open the blinds. This fully automated system makes the most of the power of controlling the windows, in order to take the load off of the conventional heating and cooling systems, while providing better natural ventilation. This system can reduce cooling costs by as much as 30% while improving occupant comfort. This system integrates easily with other system because it is “stand alone”. Smart windows control the interior environment so that it calls for heat and cooling less than it would have otherwise. Strut type thermal break provides greater strength, stability, thermal separation and also allows for two-color applications. Aluminum window aficionados know that thermal conductance through an aluminum frame is generally reduced with the use of a “poured-in-place polyurethane thermal break.” (Try saying that ten times fast!) Another way to skin that cat is the strut-type thermal break. Using this method, the front half and the interior half of the frame and sash are extruded separately, then stitched together onto a pair of strong, rigid struts. This technology originated in Europe. It is stronger, more stable and better insulation than poured-in place, and eliminates the potential for thermal break shrinkage. 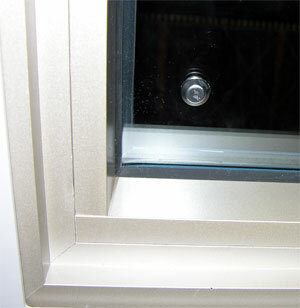 Because the frame halves are extruded separately, they allow for two-color windows. This is a great benefit when the trendy architect designs purple windows for the exterior, yet allows the occupant the design freedom of a neutral window interior. Mark Meshulam, Chicago Window Expert and Jim Dekoch, Traco Senior Project Manager check results of window testing in Traco's laboratory. Want windows of the future? Thanks but no, I am an unprofessional journalist. Wow its wonderful! Electrochromic glass is an electronically tintable glass that can be switched from clear to dark with the push of a button. Would like to know more about application in differents climates or countries, is there any practice project? updated us thanks a lot. hellow sir , would you tell me , how the vaccum glazing made ?